Mark Webber says he is "proud" of what he has achieved in Formula 1 as the Australian heads into the final race of his career in Brazil this weekend. Webber has won nine grands prix, taken 41 podium finishes and came agonisingly close to the world title in 2010. "I've done what I can, done my best but there comes a point when it's not what it once was," said the Red Bull driver. "I will leave very satisfied. I've been dealt a very good hand, (I'm) very proud of what I've achieved." The 37-year-old says he "feels ready" for his final race at the Interlagos track in Sao Paulo but is "looking forward" to the next stage of his career. He will join Porsche's assault on endurance racing, and particularly the Le Mans 24 Hours, next season. "There would be something wrong if I was disappointed to be finishing," Webber said, "because that's the reason I've made my decision, as a sportsman or woman that's why we all make those decisions: because in the end the fire is not quite what it was, and you've got to accept that. "So the time is good for me, one to go and we'll put on a very good performance, I believe I can do that in Brazil. "I'm happy I'm still driving pretty well, making my mark so to speak, but I've had my time. I've enjoyed it and achieved a few things, so let the guys do their thing in the future." Webber, ahead of this weekend, has handed out celebratory T-shirts to selected members of the F1 fraternity, bearing the logo "Made My Mark", with "#215declared" on the back - a reference to the number of races he has done. Throughout his career, he has remained humble, eschewed the glitz and glamour of F1 and is realistic about his standing in the sport. He said: "Do I see myself in the same calibre as some of the single world champions? Of course I do, but I don't have it. But I'm still very proud of what I've achieved. Am I [at the level of] a multiple world champion? Probably not. "To have had the results I've had, to have worked with the amazing people I've worked with, to race against amazing drivers on the best tracks in the world - I never thought I would do that when I left Queanbeyan in Australia [as a teenager to race in Europe]," he said. "I've learned a huge amount about myself, about everything. It's the next chapter when I step out of the car for the last time I will be fine with it." Webber led the world championship for much of the 2010 season, but ended up finishing third behind team-mate Sebastian Vettel and Ferrari's Fernando Alonso. The turning point of that season was the Korean Grand Prix. He crashed early in the race, from which Vettel later retired, and Alonso went on to victory. Had Webber stayed on the track, he would likely have ended the year as world champion. "I did my absolute best at the time," he says. "There are some drivers or sportsmen or women that have a career that is just completely like that [up] obviously, but it's very rare. "You're going to have some tough moments in there. I would never have thought I would have a grand prix career of 215 races and banging out 40 podiums and some special victories and lots of good highlights, but you always want more, it's human nature." Webber admits that the number of reliability and operational problems that have afflicted his car this season has been "frustrating" but says he is "happy my form has not been a problem". He has beaten Vettel to pole position in two of the last four races and is aiming to do so again this weekend - and hopefully follow that up with a win. But he will get no favours from Vettel, who is trying to equal the all-time record of nine consecutive F1 world championship wins. Webber has had a strained relationship with Red Bull in the last five years, feeling the team favoured Vettel over him on a number of occasions - even when they were claiming to allow them both equal opportunity in 2010. Webber says he never had a problem with Vettel until the German ignored team orders not to pass Webber to win the Malaysian Grand Prix in March this year. Since then, the two have had a difficult relationship this season, although they have become noticeable warmer towards in each other in the last couple of races. Red Bull team boss Christian Horner said: "Mark wouldn't want to be gifted a win. It would be great to see him win his final race - what a way to sign out - but Sebastian's going to be going for that record as well. "So as usual it will be a straight fight between the two of them." 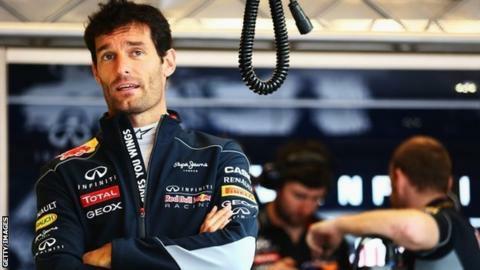 Watch an interview with Mark Webber reviewing his F1 career in the lead-up to the Brazilian Grand Prix on BBC One on Sunday 24 November from 16:00 GMT.